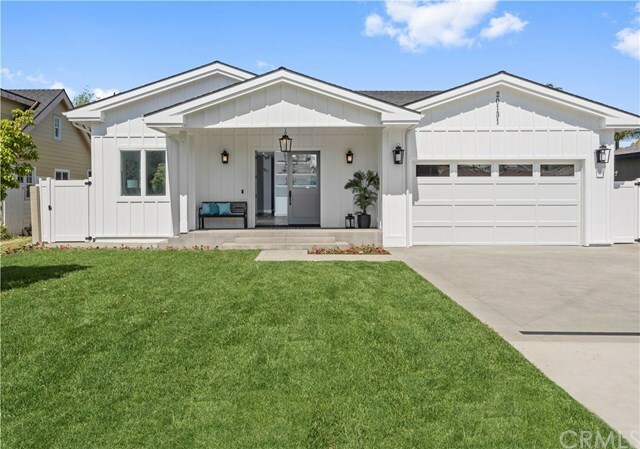 This newly built Modern Farmhouse in Newport Beach is a must-see. Situated in Bayview Heights - a peaceful equestrian enclave bordering the scenic Back Bay - you?re at the heart of everything Newport has to offer, from hiking trails to fabulous shopping and dining to the harbor and beach. Spanning approximately 2,800 sf, the 3 bedroom, 2 bath home includes an office (or optional 4th bedroom) and is on one of the most sought-after streets in this welcoming community. High ceilings, large windows and walls of glass doors open to the outdoors, creating a lovely, light-filled home designed for indoor/outdoor living. Stylish, high-quality finishes clad every surface, from plank wood floors to slab stone to artisan marble. The large, open format kitchen is fitted with Viking stainless steel appliances and a large center island, and adjoins a bar/buffet area and dining room - all opening through bifold doors to a covered terrace and the private, sunny backyard. The master suite includes a large dressing room and a spa bathroom with oversized shower, deep soaking tub and dual vanities. Other highlights include a large laundry/craft room and a 2-car epoxy-finished garage. This home also offers access to award-winning public schools, including Mariners Elementary.